To help us get ready for the next few weeks of craziness, I took a day this week and knocked out all the cooking we would need for the next month! I am not a big freezer cooker normally, but now that it’s done I’m pretty excited to know that after long days (and long nights with a new born) that I won’t need to worry about dinner. The freezer cooking recipes that we did all used common ingredients to cut down on cost and time. Printable Shopping List – everything you need to make 23 meals! Don’t feel the need to buy this all at one time, this will help you shop from your pantry too. Printable Labels for Meals – cooking instructions and details all ready for you. Print on labels or just cut them out and tape on. Printable Recipes – a copy of what is below, just more handy. 1. In a stockpot, melt the butter over medium heat and add the onions, salt, and pepper. Cook until the onions are translucent, about 7 minutes. Add the peas and carrots and cook until heated through. 2. Sprinkle in the flour over the vegetable mixture and cook, stirring continuously, until the flour has turned a blonde color, about 2 minutes. Whisk in the chicken stock and continue whisking until the mixture is completely smooth. Allow to come to a gentle simmer and cook until the mixture has thickened slightly. Stir in the shredded chicken and heavy cream. 3. If you’re using bottom crusts, press a crust into each of your 5 pie pans (I used disposable). Ladle the chicken mixture evenly between the pans and top with the remaining crusts. Press the bottom and top crusts together at the edges and crimp. 4. Allow to cool before covering with foil, labeling, and placing in the freezer (it might be easiest to freeze your pot pies on cooking sheets so they don’t spill out). To cook: Preheat the oven to 350 degrees. Cut 4 small slits in the top crust of your pie to allow for ventilation. Bake on a cookie sheet for 50-60 minutes until the crust is golden brown and the filling is bubbly. If your crust begins to get too brown before the filling is ready, you can cover the whole pie in foil. 1. Heat the olive oil in a large saucepan over medium heat. Add the peas, carrots, and onion and cook until vegetables are tender, about 8 minutes. Add salt and pepper to taste. Stir in the Worcestershire sauce and ketchup and heat through. Add the ground beef to the mixture and stir. 2. While the vegetables are cooking, make the gravy. In a saucepan over medium low heat, melt the butter. Whisk in the flour and cook until the flour is a blonde color (about 1 minute). Whisk in the broth in small increments until smooth and allow to cook until slightly thicker (about 4 minutes) while continuously whisking. Add the gravy to the meat mixture. 3. To make the topping, peel the potatoes and cut into chunks. Add them to a saucepan and cover with water. Boil until tender. Drain completely and mash with a potato masher. Add the milk and mash until your desired consistency is reached. 4. Add the meat mixture to the bottom of a casserole pan (I used disposable). Add the mashed potatoes on top of the meat mixture and be sure that they are even and that all holes are sealed. Cool, cover, and freeze. To cook: Thaw in refrigerator overnight. Cook in a preheated 350 degree oven for 30 minutes or until heated through and slightly bubbly. 1. Heat the olive oil in a large saucepan over medium heat. Add the onions, bell peppers, and jalapenos and cook until soft, about 8 minutes. Stir in the corn and black beans and heat through. 2. Add the cooked chicken, along with the salt, pepper, and cumin. Stir in the cream cheese and 3 cups of the shredded cheese. Keep stirring until everything is melted and well combined. 3. Add a half a jar of salsa to the bottom of each casserole pan (I used disposable) and spread around (this helps prevent sticking on the bottom). Fill a tortilla with approximately 4 tablespoons of the chicken mixture, roll tightly, and place in the pan. Repeat with the remaining tortillas until you have 8 rolled tortillas in each pan (24 total). 4. Top the enchiladas with the remaining salsa (about 1/2 a jar for each pan). Add the remaining cheese to the top (about 1 cup for each pan). Cool, cover, and freeze. To cook: Thaw in refrigerator overnight. Preheat the oven to 350 degrees. Cook covered for about 25 minutes and then cook uncovered for an additional 10 minutes, until the filling is bubbly and the cheese has melted. 1. In a stockpot, melt the butter over medium heat. Stir in the garlic cloves and cook until fragrant, about 2 minutes. Add the heavy cream along with the salt and pepper and allow to come to a gentle simmer. Cook until slightly thickened and reduced, about 5 minutes. 2. Stir in 2 cups of the grated Parmesan and stir continuously until the cheese has melted and everything is smooth. Add the cooked chicken and stir. Add the pasta along with the peas and broccoli and stir until everything is well coated with the sauce and evenly distributed. 3. Divide the pasta mixture between 3 casserole pans (I used disposable). Sprinkle the tops with the remaining parmesan. Cool, cover, and freeze. To cook: Thaw in refrigerator overnight. Preheat oven to 350 degrees. Cook covered for about 25 minutes and then uncovered for an additional 10 minutes, or until everything is bubbly and the cheese has melted. 1. Whisk together garlic, broth, Worcestershire sauce, onion powder, parsley, thyme, flour, salt, and pepper in a bowl. 2. Add 1 pound of the ground beef and 1 cup of the mushrooms to a large freezer bag and repeat with 2 more freezer bags (3 total). Divide the broth mixture evenly between the bags. Seal tightly and freeze. 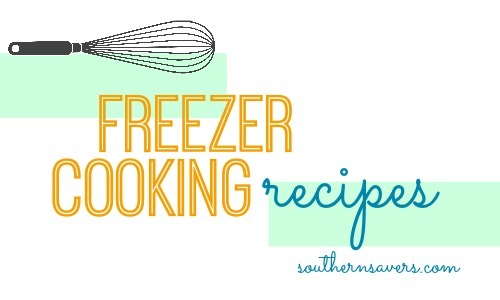 To cook: Thaw freezer bag in refrigerator overnight. Add contents to slow cooker and cook on low for 6-8 hours. In the last 30 minutes of cooking, add the cream cheese (1/2 of 1 block). Stir and break up after 15 minutes and cook for 15 more minutes. Stir in the sour cream (1 cup) and heat through. Serve over egg noodles. Tip: Remember that the ingredients listed are for 3 meals, so you’ll have to divide each listing by 3 for it to make sense in each recipe. 1. Toss the potatoes with the flour and divide between 3 freezer bags. Divide the rest of the ingredients by 3 and add to the freezer bags (1 cup of diced onion in each bag, 1 package of corn in each bag, etc.). Seal tightly and freeze. 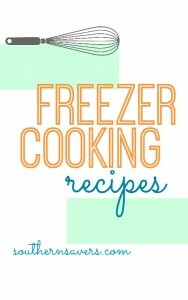 To cook: Thaw freezer bag in refrigerator overnight. Add contents and 6 cups of chicken broth to slow cooker and cook on low for 6-8 hours. Stir in the heavy cream (1 cup) in the last 30 minutes of cooking. Serve with crumbled bacon. Tip: If you’d rather simply store your stock in your pantry, you can freeze all the ingredients except that in your freezer bag and add the stock when you’re ready to cook. Also, remember that the ingredients listed are for 3 meals, so you’ll have to divide each listing by 3 for it to make sense in each recipe. 1. Divide all ingredients into 3 freezer bags and shake to combine. Seal tightly and freeze. To cook: Thaw freezer bag in refrigerator overnight. Add contents to slow cooker and cook on low for 6-8 hours. I also had 3 cans of pasta sauce and 3 cans of tomatoes that I threw into bags with the extra hamburger for spaghetti sauce. Go ahead and also mince a garlic clove in there too.